The major cause of record wear/damage is “shock-wave fracturing” . A pressure wave is produced by the phono stylus (needle) as it passes through the record groove. Rapidly moving pressure waves radiate from the two areas of stylus contact on the groove wall. These pressure waves travel ahead of the stylus as it moves along the groove in the same way as a bow wave moves ahead of a boat. When the pressure wave encounters a microcrack, flaws in the vinyl, or other surface imperfections, the energy builds up, forming a shock wave that can exceed the cohesive forces holding the surface together. When this happens, cracks occur in the vinyl and fragments can be blown off the groove wall. This kind of damage can occur on the very first play, and will increase exponentially as a function of both the number of plays and stylus loading. Although a new record may look clean on the surface, it is not. Every new record has surface residues and record-pressing compounds left over from the manufacturing process. 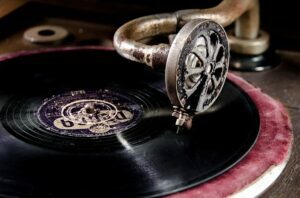 From the moment a record is removed from its cover, dust particles in the air are electrostatically attracted to the record surface. Also, normal handling of records can add debris, fingerprint oils, salts and residues. These surface contaminants are additional sources of wear. Dirt can be picked up by the leading edge of the stylus and dragged along, scraping a gouge in the groove wall. Alternately, the stylus can pound dirt into the vinyl where it becomes the center of a new shock-wave damage site.